Good tools to help get the job done. There are a lot of great tools out there for animation. What we want to do is give you a great set of tools for working with our characters. That’s why our asset delivery system is built on a few custom, hard working tools. The Character Manager provides a backbone for which we build your whole experience upon. 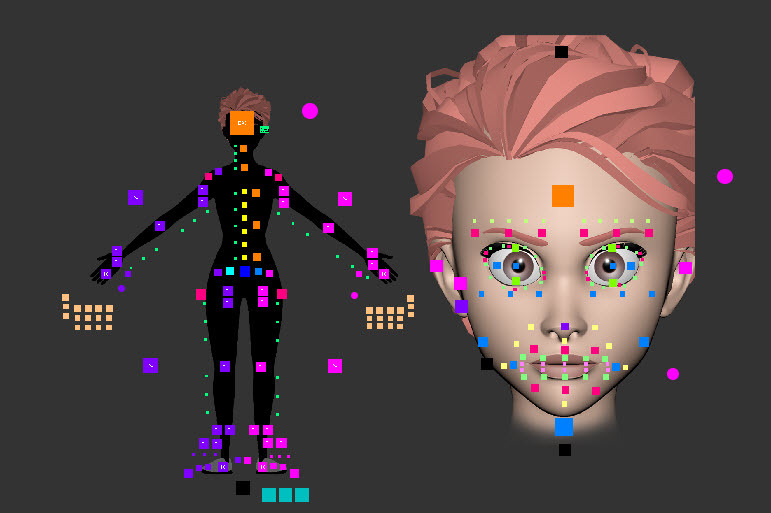 This Maya tool allows you to download any of our characters at any time. You can use it to manage what characters you have locally and what characters you have in your scene. With referencing being the ideal workflow for rig management, this tools handles all that for you easily. It also helps you save new versions of any character, update your rigs in scene with the latest files from our server and of course, import and remove characters from your scene. This simple but helpful tool allows the user to select a child, and a parent and get an animation curve baked connection. Using point matching, this tool simply bakes out a connection between objects giving you a simple, editable way to handle constraints. It can also be used for matching IK limbs to FK blocking, snapping knees to objects or, their animation path, as well as many other handy little workflow tricks! The Hand Key tool is a simple inbetweener. There are a couple notable features however. First off, you can set your default animation curves to auto or stepped. This allows you to easily switch between blocking and splinning. You can also use this tool with channels selected. This will focus the tool on the selected channels and help you build better offsets. Our focus is to provide you with simple, easy to use tools to improve your animation experience. Think of your Long Winter Membership as a ticket to your own rigging department. We want to help you succeed by giving you easy access to high quality assets and tools. Having a reliable rig is one thing, we want to take it a step further. With pose libraries for some of our newer characters, we’re working to build libraries for all our “Recent” characters. Using Studio Library to build out a handful of expressions and hand poses gives you a head start on your animation as well as a little insight into how to best pose our characters. With Animschool’s amazing pickers, you’re workflow can be faster and your scene can be control free. We’ve kept these simple, with just the controls, but you’re welcome to modify them with your own selection sets and custom commands! These work with the Studio Library poses as well, making selecting affected controls easy.